Ok. The autumnal equinox has officially come and gone. I can now get behind this whole “it’s fall” thing. And nothing says fall to me like fairs. Street fairs. Agricultural fairs. I love ‘em all. It’s been a long held, not-so-secret desire of mine to attend one of the monster state fairs (Minnesota and Texas, I’m looking at you!). It doesn’t look like my dream is going to be coming true this year…booo…but that doesn’t mean I can’t make funnel cake at home…? Yes, funnel cake at home. For fair junkies like me without a fix in sight this may very well be the next best thing. And the recipe I developed for my American Classics column over at Serious Eats is super easy (hint: it involves “complete” pancake mix) and best of all you can control your funnel cake size and toppings. 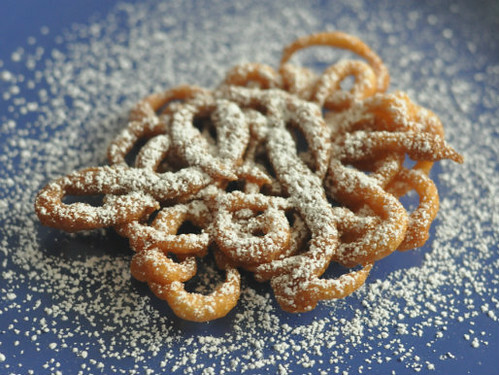 Funnel cakes are just the tip of the iceberg of the wonders that are fair foods. Fried dough pizzas, hot fudge sundaes, fried pickles on a stick, cotton candy, caramel apples...the list goes on and on. I love when fair foods represent their particular region. Growing up in New England it wasn't uncommon to find a local church or group like the Rotary Club or Lion's selling clam chowder in a fair booth as a fundraiser for charity. What’s your favorite fair food? And where do you get it?